Written by webmaster Category Notification. History is the essence of innumerable biographies! Thomas Carlyle…. The phenomenal growth, progress and spectacular achievements of the FOGSI speak volumes of the solid foundation laid as well as the able guidance and leadership provided by the founder members. The first three existing Obstetric and Gynaecological Societies were established in 1934 in Bombay, Bengal and Madras. The first All India Congress was held in Madras in 1936 where it was decided to establish societies in other parts of India, publish a journal of as the official organ and undertake publication of textbooks for nurses and midwives. Five such Congresses were held in all, two held in Bombay (1938 and 1947) and one each at Calcutta (1941) and Lahore (1945). With the advent of the Second World War and problems due to partition the organization of Congresses had a setback in 1943 and 1949. It was in 1950 that things really got revitalized. In a very historic moment at Madras on January 6, 1950, five societies – Bombay, Madras, Bengal, Punjab and Ahmedabad convened and resolved to form the Federation of Obstetric and Gynaecological Societies of India (FOGSI), a non profit making academic organization which was to be registered with its Headquarters in Bombay. The pioneers included Dr. Laxmanswamy Mudaliar, Dr. N. A. Purandare, Dr. Chammanlal Mehta, Dr. Subodh Mitra, Dr. R. K. Thampan, Dr. K.M. Masani, Dr. J. Jhirad, Dr. Chakravarti, Dr. Herculano DeSa and so many others. 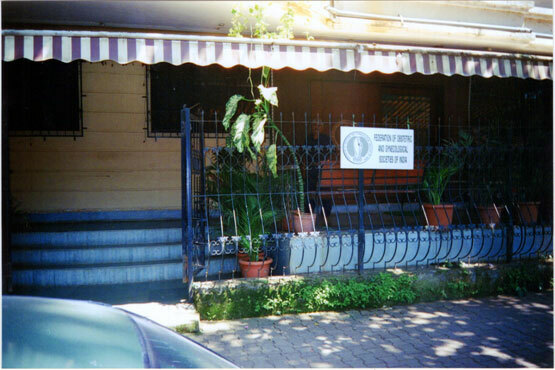 FOGSI was formed with the object of sharing solidarity amongst the obstetricians and gynecologists so that a common and authoritative voice could be presented in the progress of the ever expanding sciences of Obstetrics and Gynecology including physiology of reproduction, family planning and mother and child care. FOGSI set up its Registered Head Office – Headquarters at Purandare Griha, Bombay. Since the Bombay Society was using the premises of Dr. N.A. Purandare’s hospital, FOGSI was allowed to share the BOGS premises on the fifth floor ex gratis but for a nominal token. FOGSI was born on the January 6, 1950 with Dr. J. Jhirad elected its first President at the first meeting of the first FOGSI Managing Committee. During this period Presidents were in chair for two year tenures. The focus was on the concept of Maternal and Child Health care. This included scientific sessions and work on prevention of anemia, promoting the importance of a balanced diet and provision of blood transfusion services. FOGSI was affiliated as a founder member of the International Federation of Obstetricians and Gynecologists (FIGO) in 1954, headquartered in Geneva. with a seat on the executive board. FOGSI also got affiliated to the Asian Federation of Obstetrics and Gynecology (AFOG) in 1959. 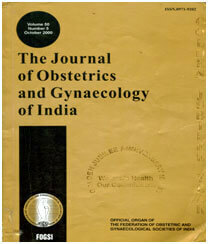 The Journal of Gynecology and Obstetrics of India was Dr. N. A. Purandare’s brainchild. 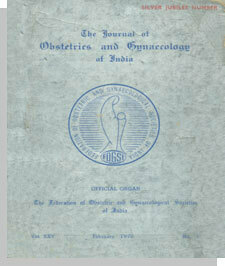 The journal as the official organ of FOGSI was eventually started in 1950 with Dr. Jhirad as the Founder Editor. The initial publication was quarterly and this continued till 1964. The journal was accepted by various international journals for exchange of ideas and was regularly screened by publishers of the Year of Book of Obstetrics and Gynecology. These two decades saw many important strides in the growth and development of FOGSI. In the early 60’s FOGSI joined hands with Central and State Governments in India to accept the challenges posed by the problems created by population explosion and channelized its activities in the field of family planning. More societies got affiliated and the number of members increased. 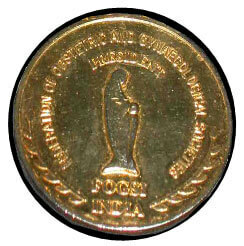 In 1962 the Second AFOG Conference was held in Calcutta, presided by Dr V. N. Shirodkar when he was also President, FOGSI. The first International Seminar on Oral Contraceptives was organized in 1965 and recommendations were made to the Government of India to initiate the Pill Project at selected places in India. It was during this time that the FOGSI Logo was adopted and became the representative symbol of FOGSI. It is now a registered copyright that continues to be used till date. In 1965 the GOI formed the Dr. Shantilal Shah Committee for the legalization of abortions where FOGSI was represented by the FOGSI President and Secretary. Against much opposition and resistance but with support from professional, women’s organizations and other NGOs, the GOI changed the statute and called the bill the MTP Act of 1971. The Mrs. Indumati Jhaveri Conference Prizes were established in 1966 for the best three presentations at the All India Conference these being the first of many FOGSI prizes since established. 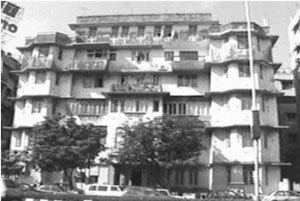 The first International Seminar on Maternal Mortality, Perinatal Mortality and Reproductive Biology was held in Bombay in 1969. Seen below is an archived photograph from the conference. Due to increasing number of delegates and enthusiastic members, the All India Congress of Obstetrics and Gynecology (AICOG) started being held annually. The first annual AICOG was held in Manipal in 1974. This gave an opportunity for many more members to present their scientific work from a national platform. By this time around 41 societies were affiliated and the stood at 2000 members. The concept of having orations was started at this time. The first FOGSI oration was known as the FOGSI Rallis Oration delivered by Sir Stanley Clayton, then President of Royal College of Obstetricians and Gynecologists (RCOG) in 1975. It was resolved that the family planning programme including mother and child care in all states be entrusted to the heads of the departments of obstetrics and gynecology at all hospitals attached to medical colleges and district hospitals for effective implementation and execution. In 1975, FOGSI had the unique honor of hosting the Annual Executive Board Meeting of FIGO in Bombay during the Second International Seminar. The President’s Rotating Gold Medal was donated by Dr. S.N. Upadhyay in 1974 and the tradition of having it handed by the Outgoing President to the Incoming President established. A new vision and concept was introduced in 1975 with the constitution of Scientific Committees. Initially six committees were formed – Maternal Mortality, Perinatal Mortality, Medical Termination of Pregnancy, Family Planning and Oncology and Trophoblastic Tumours. Each committee was formulated with a team of members to work towards their aim through Continuing Medical Education programmes and projects with the goal to help in sensitizing other members and address these existing problems. The Asian Federation of Obstetrics and Gynecology became the Asia Oceania Federation of Obstetrics and Gynecology (AOFOG) in 1979 with inclusion of Australia and New Zealand in its fold. 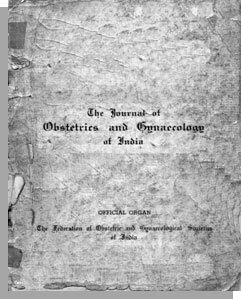 In 1965 the Journal of Gynecology and Obstetrics of India started getting published bimonthly. The landmark Silver Jubilee issue of the Journal was published in 1975. In 1973 FOGSI office appointed its first fulltime staff members with Miss V. Bhandarkar joining in1973 and Mrs. Flory Henry joining in1978. Both these dedicated individuals have been working with FOGSI ever since leading an office that has grown from strength to strength. Over the years FOGSI grew in strength as well academic commitments. More and more societies got affiliated every year to FOGSI after conforming to the rules and approval of the Managing Committee and General Body. Over 142 societies were added in these years. All the important posts in FOGSI now started having more than one contender and so naturally there were elections. Many more committees were formed. Their activities were focused with a view to improve not only maternal and child health but other areas related to women’s health and wellbeing such as adolescent health, HIV and AIDS. Since these decades also witnessed technical advances, FOGSI initiated activities in this area and established committees for Infertility, Genetics, Endoscopy and Imaging Science. The concerns about litigation that cropped up at this time led to the establishment of the Ethics and Medicolegal Committee. Many FOGSI committees organized workshops and set up training programmes to train members and conducted CMEs to update their knowledge in their field of interest. Since this involved large numbers of FOGSI members it generated tremendous response and enthusiasm amongst them. The FOGSI committees soon proved to be the backbone of FOGSI. To carry forward its vision to be leaders in the field of academics, FOGSI established the Indian College of Obstetrics and Gynecology (ICOG) at Durgapur, at the 28th AICOG on December 28, 1984). The purpose of the ICOG was to promote education, research, training, diseminate of knowledge and to bring academic excellence to FOGSI. Two hundred and five members were admitted as Founder Fellows. The regional grouping of the South East Asian Federation of Obstetrics and Gynecology (SAFOG) was established with FOGSI as a founder member in 1995. This also included Sri Lanka, Pakistan, Bangladesh and Nepal. The acknowledgement that these neighbors had similar challenges and problems justified the need for mutual discussion and coordinated approach to find solutions. With FOGSI growing exponentially the FOGSI office was shifted to larger premises on the sixth floor of the Cama and Albless Hospital in Fort, Mumbai. FOGSI’s alliances with the GOI, WHO, UNICEF and UNFPA grew stronger with FOGSI taking a leadership role in issues related to women’s health and acquiring credibility for work done. FOGSI joined hands to conduct 22 RCH workshops with the GOI to propagate knowledge to doctors and paramedical personnel in rural areas. This was conducted in partnership with member societies. FOGSI was invited to participate as member of the National Population Commission which was chaired by the Prime Minister of India as also many committees working on women’s health issues at the Ministry of Health and Family Welfare. From 1997 the FOGSI President started adopting an Annual Theme with the intention of giving a sense of direction and perspective to the work during the year. Affiliated societies conducted symposia and activities related to the theme throughout the year. Apart from medical issues FOGSI used the themes to address social issues affecting the health of young girls and women such as promotion of breast feeding practice, young talent promotion, education and empowerment of the adolescent girl. The AICOG was now held annually with eminent foreign and national faculty being invited for the scientific deliberations. Junior delegates were encouraged to present scientific work on clinical research and many prizes were instituted for the same. Societies doing good work also were awarded with rotating trophies. The intensity of activities could be judged from the tremendous responses for the FOGSI prizes related to adolescent and RCH activities. FOGSI has gradually moved on from being just an academic body conducting educational programmes for its members, to achieving higher goals in promoting the social change and improving the status of women in India. The Golden Jubilee Anniversary Issue of JOGI was published in October, 2000. Besides introducing a new cover and layout, there was inclusion of guest editorials and review articles and a streamlining of administration and peer review process. In 2001 the Yuva FOGSI Conferences were initiated with the intention of providing young doctors a platform to project themselves and present scientific work. The conferences were organized on a zonal format and it was mandated that eighty per cent of the faculty had to be less than 40 years of age. Even the orations delivered at these conferences were by outstanding young FOGSI members from that zone. These conferences enabled intermingling of the ideas of two generations. FOGSI was now party to consultations and involvement in all important policy matters related to women’s health issues by the Central and State Government. Liaison with the GOI, WHO, medical colleges and NGO’s had increased and many more activities and programs were undertaken. The Safe Abortion initiative was undertaken in 2001 to address to challenges posed by unsafe abortion with 52 workshops conducted across India by the MTP committee to sensitize over 10000 doctors. FOGSI provided technical support in the promotion of MVA and medical abortion as also to the amendments of the MTP Act and Rules in 2002 and 2003. The MVA Pilot Project was the first major technical implementation partnership with the GOI and WHO to train 120 medical officers from PHCs and CHCs of 16 districts from 8 states. It demonstrated the feasibility of creating a training infrastructure and conducting training in MVA for these grass root practitioners in just two weeks. Adolescent school and college programmes on reproductive health and HIV were undertaken throughout the country. An Adolescent Empowerment project – Kishori was conducted in partnership with Sneha, UNICEF and LTMG Hospital for the adolescent girls of the urban slums of Dharavi to help them to become more self reliant. Averting Maternal Deaths and Disabilities project was undertaken collaboration with Columbia University and Gates Foundation where peripheral health centre doctors and paramedical personnel were trained to give basic emergency obstetric services. Emergency Obstetric Care project of FOGSI and GOI (National Rural Health Mission) has established many centers in India for imparting training to medical officers in the peripheral health centers. This is an important step in reducing maternal deaths and mortalities in peripheral hospitals and has since progressed into extension and partnership with individual state governments. FOGSI established Helplines for Emergency Contraception, Post Exposure Prophylaxis and Medicolegal issues. The ICOG was brimming with activity with 650 new fellows admitted. ICOG began awarding credit points for academic excellence, introduced ICOG international fellowships and set up international student exchange programmes. A new FOGSI Flag was adopted, an inspirational song the Spirit of FOGSI was penned by Mr. Javed Akthar and sung by Ms. Alka Yagnik and the designation of certain days every month as FOGSI days. FOGSI now involved in many social projects ranging from anemia eradication to village adoption. Landmark Yatras as a social outreach initiatives were undertaken. These included the Ganga Yatra and the Bharat Jagruti Yatra which reached out to rural populations and creating health awareness. FOGSI finally acquired and moved into its new premises in April 2007 a great step in the history of FOGSI which now had its own permanent address for its office, ICOG and JOGI.